Looking for something that's dressy as well as comfortable? In recent years it's been increasingly acceptable for the mother of the bride or groom, or indeed the grandmother, to wear formal pant suits. For grandmothers, some designers of pant suits even offer an elasticated waist band for greater comfort. They also can solve the problem of what to wear at your granddaughter's wedding, as they comprise a two or three piece outfit with top, jacket and pants. The pantsuit offers a practical and classy design option for curvy plus size women who can opt for long wide-leg trousers to create an elegant and trendy look for any occasion. Pant suits can be especially suitable and helpful if you prefer to wear flat shoes for practical or health reasons, as you can still dress up for this special occasion, but without having to sacrifice your comfort. Whilst some special occasion outfitters do now stock formal pant suits, it's certainly worth phoning ahead to check stock availability in your size if you're planning to visit. 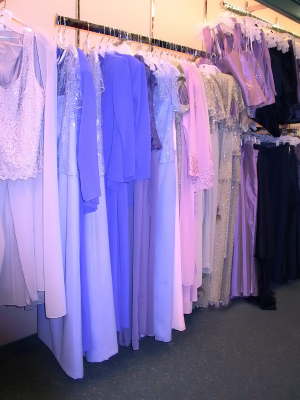 You may also find some party wear clothing may be suitable - and this can be bought in a number of your usual stores. Special occasion wear is often readily available in some of the petite or plus size specialist stockists. Other options will include buying online - making sure that you've checked out the stores returns policy. It's often possible with some online shops to order a couple of styles in a couple of sizes, so that you can try on in the comfort of your own home and keep the outfit that you feel suits you best. Check for type of material, pockets, trim, size guide, inside leg measurement (you can always take up a hem, but can't always let it down without leaving a line), waist type (high, elasticated, etc) and closure style (e.g. button, popper, etc) - to ensure that you've considered all those items which you do subconsciously when trying on style in a department store. If you're thinking of shopping online, stores such as Audreys & Women Suits offer a range of special occasion wear specially designed with additional detailing such as beading, in delicate fabrics such as silks & georgettes. Before making your purchase, remember to check out the return policy, shipping costs and wash guide instructions. Finally, you'll want to accessorise your outfit - so choose a color or shade that won't make this task too hard. Some grandmothers have had to have a hat created especially to match a particular outfit that they've chosen, which may be an expense that you haven't budgeted for. When choosing footwear, you can get away with something more comfortable as it will be "hidden" by your pants - so you can opt for comfort rather than style, if you wish. Of course, you can also go for a glamorous look with matching or toning sandals, just make sure that the pants are long enough to look right with the heel height you choose. As for etiquette, it's worth checking with the bride about what color theme she's planning to choose, but the only really taboo colors are white, cream and black, so go on and enjoy yourself!